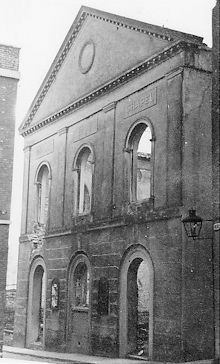 Norley Congregational Chapel, in Norley Street, Plymouth, was opened on December 8th 1797 and called the New Tabernacle because it replaced an older building in Breton Side. Norley Congregational Chapel, Norley Street, Plymouth, 1942. Thanks to an increasing congregation, work start on June 24th 1833 to enlarge the building. The cost of this work was £774. While this work was proceeding the congregation moved on weekday evenings to the How Street Baptist Chapel and on Sundays to the Mechanics' Institute in Princess Square. On November 13th 1833 the building was reopened under a new name -- the Norley Congregational Chapel. A new pastor was appointed by the name of the Reverend George Smith, from Liverpool. He had preached from the pulpit of the New Tabernacle back in March 1833 and so warmly received that he was invited to come to Plymouth. Through his work the congregation increased and when a public meeting to discuss the anti-slavery campaign was in danger of falling apart, it was he who got to his feet and brought the confusion to an end. One amusing incident linked to the Norley Chapel at that time was the story that circulated about the unsafe galleries that had been added. It was suggested that a group of soldiers should be sent up to test their stability. The problem was overcome by a more simpler and novel method. A member of the How Street Baptist Chapel, Mr George Frean, a miller and founder of the Messrs Peak, Frean biscuit business, had a number of sacks of flour carried up. These well exceeded the possible weight of the people who might use the galleries and so their strength was considered proved. A further association with the How Street Baptist Chapel occurred on August 1st 1834, when a joint thanksgiving service was held to celebrate the abolition of slavery in the British colonies. The choir went on strike one Sunday during the service. Apparently the choir sang a hymn to a tune that the congregation did not know. This brought a remark from the Reverend Smith, during his sermon, that: 'I wish our friends in the choir had given us a tune that all could have joined in the singing.' This upset the choir master, who secretly sent a message around the choir and when the introduction to the next hymn was said, both they and the organ remained silent. A member of the congregation came to the rescue and pitched the tune, after which the hymn was sung with gusto. This upset the choir master even more and he and several of the choir left and transferred to Charles' Church. At a meeting held in the residence of Mr Samuel Derry, in Ham Street, on September 19th 1836 the Plymouth Town Mission was formed. The founding members were Mr Samuel Derry; Mr Richard Derry; Mr J Morrell; Mr J Plimsaul; Mr T Carter; Mr W Stumbles; Mr H Wills; Mr R Wills and Mr T Page. On July 17th 1837 the Chapel was registered for the solemnization of marriages. In fact it held the first Nonconformist marriage ceremony in Plymouth on Thursday July 20th 1837 when Mr George Tyerman of Whimple Street married Miss Mary Ann Oliver, of Devonshire Place. A plot of land to the rear of the Chapel was purchased in 1838 from a Mr Codd, of Norley House, for the erection of a Sunday School. The need for a larger chapel became evident during 1860 and a site was purchased the following year for a new, larger and grander building to be named the Sherwell Congregational Chapel.